Anarkali dresses are a trend in India from a long time. It is believed that their origin is from the dancer Anarkali of the Mughal court. She used to wear this dress which has a long kurti with either half or full sleeves in tight form. It is the kind of salwar kameez where the kurti fits tight above the waist and below the waist it expands like an umbrella. Hence the name anarkali dress. People often wear the anarkali dress when they attend any party, functions and weddings. If you have no time to drape yourselves up in a saree for any wedding function, then this is the best option to go for. It is definitely one of the best ethnic wear in India. If you have observed in the recent times, many Bollywood actresses are wearing anarkali suits for award functions and weddings. Aishwarya Rai is mostly seen in Anarkali suits post her delivery. Even the new generation actresses are often seen sporting them. Now, lets check out some of the wonderful anarkali suits which made the stars look even more beautiful. Anushka Sharma mesmerized everyone at Ritesh-Genelia wedding reception. She wore a mutli-color anarkali with a deep V-neck. Parineeti Chopra looked gorgeous in her brown anarkali with pink and navy blue bands on hemline. 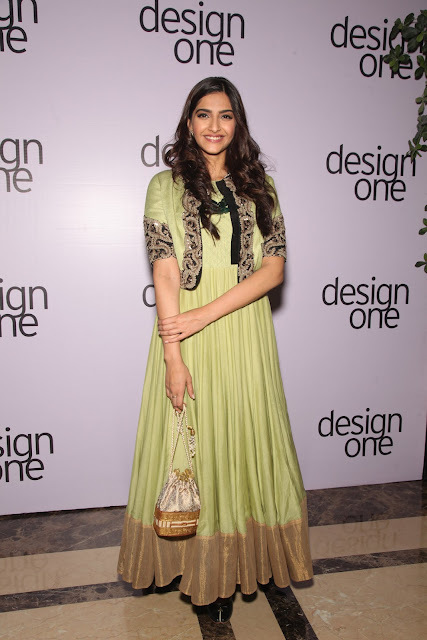 Fashion diva Sonam Kapoor looks all smiles in her green colored jacket style anarkali suit. Deepika Padukone looks stunning in her black anarkali with golden embroidered collar neck and golden patch border. Asin keeps it simple with her green anarkali dress with silver color embroidery. Desi girl Priyanka Chopra looks ravishing in Manish Malhotra's white anarkali suit. Sonakshi Sinha attends Amitabh Bachchan's birthday party in a blue anarkali suit with pink color border. Kajol wears a mehendi color anarkali designed by Manish Malhotra at MNIK film premiere. Genelia looks pretty in this long blue anarkali suit. Kareena Kapoor looks stylish in this beautiful off white anarkali suit with a floral embroidered neckline. Madhuri Dixit reveals her fashion sense in this vibrant yellow anarkali with orange shade on the sides. When Aishwarya Rai was awarded the french honour she wore Abu Jani-Sandeep Khosla heavily embroidered pink anarkali suit. Do you like anarkali suits? Which is your favorite in the above anarkali dresses? Thanks dear...they look beautiful right. madhuri dixit n deepika looks wow..
Can i buy this anarkali in online?. I love this ! Really like the embroidered tops,such a pretty piece for summer afternoon at the seaside!